Social media is no longer just about sharing pictures of what you ate for lunch. A new trend among younger parents is "child shaming" -- sharing humiliating videos of their punishments on Youtube and Facebook. Our eyes are hardening. We can barely see our phones anymore. It’s time to look up at the wide, wide world. No, really, the whole human race is going screen-blind. Facebook CEO Mark Zuckerberg testified before Congress this week, regarding the company's privacy practices. Zuckerberg said "Every piece of content that you share on Facebook, you own and you have complete control over who sees it, and how you share it, and you can remove it at any time." But Wired Security editor Brian Barrett begs to differ. Soylent the meal replacement drink that was available only online, last year, is now available in Walmart and 7-Eleven stores. I'm not sure if I would trust the ingredients listed on the Nutrition Facts panel. Watch these robots 3D-print an entire bridge. This just in from the Unintended Consequences department: A bug that Microsoft introduced into a popular open-source archiving app would allow .rar archive files to be used by hackers to take complete control of victims’ computers. Better yet, the compromised app was part of Microsoft’s Windows Defender antimalware system. Amazon is shutting down its subscription cloud storage service for music files on April 30. Here is what you need to know if you’re a subscriber. Google's Gmail service will get a makeover during the next few weeks, likely becoming more like the mobile Gmail app, as Calendar has. Expect a cleaner, more icon-driven look, plus features such as Smart Reply, scheduled future sendings, and offline work. Faster, more timely rollouts of Android upgrades could be the blockbuster product differentiator, putting the company who achieves this goal ahead of the pack. LG Electronics hopes to become that runaway best-seller with its new Software Upgrade Center. Most recent comments on "Geekly Update - 12 April 2018"
I wonder if they're paying royalties. I had the same reaction David. Have we hit the point that we recycle ourselves? Like Dave, I too am astounded at the choice of name. Anyone who ever saw the film Soylent Green will know what I mean! Thank you, Mr. Rankin for that image of TheZuck as the DataAccumulator. 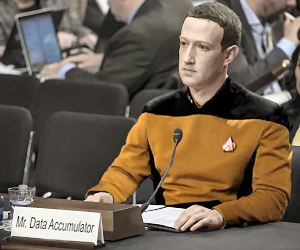 Since his face has been all over the media this week... and my internal FacialRecognition must've been out to lunch lately; I could correlate between Facebook's TheZuck and StarTrek's Data. But OMG! A recent article stated that cremations have barely edged out burials in the past few years: But the environmentally safer "alkaline hydrolysis" process is said to be the up-and-coming corps disposal method of choice. If Rob Rhinehart (or Rosa Foods) was a true visionary, he would have employed the "left-overs" of this new disposal process as an ingredient for his nutritional alternative. [Salt and pepper optional]. Singing rumble strips - for goodness sake don't tell anyone involved in Australian traffic engineering. The other go slow engineering feats like pelican crossings are bad enough without adding music to the agenda. This "sharing" is one of many reasons that I am not on Facebook and never will. It would had been so cool if Zuckerberg had appeared before Congress as Data, since Congress does not take privacy seriously anyway. Soylent Green, it taste like chicken. Doesn't most food taste like Chicken? I see that there are several who connect Soylent with Soylent Green. I wouldn't touch this stuff for ALL the tea in China!!! In my mind, it would always be cannibalism. Gmail: NOOOOOOOO! DO NOT WANT!!!! I specifically don't use Gmail on my phone BECAUSE it doesn't work the same way as on my PC. NOW what am I gonna do. The already messed with the Gmail Calendar, it's TWICE as hard to use.